Seacrest Beach Florida is one of the most quiet residental communities along scenic highway 30A. This is due to the fact that there is virtually no commercial development. Along the western edge of Seacrest Beach is Camp Creek, one of the most scenic places of the dune lakes. Legend says that the lake was named after the Creek Indians who were rumored to live in this area. Seacrest Beach is also the location of Deer Lake State Park, a great place for viewing nature in its local habitat. Seacrest Beach also boasts some of the highest sand dunes along Highway 30A. They are so high that you can easily view dolphins as they swim in the distance. Here at 30A Escapes, we have several well appointed Seacrest Beach rentals for any size of family. 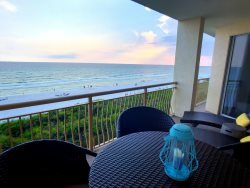 Whether you are looking for a condo style for a last minute getaway or a larger vacation home with a private pool and amazing gulf views... 30A Escapes has the ideal Seacrest Beach vacation rental for you! We look forward to being your Seacrest Beach Vacation Concierge!